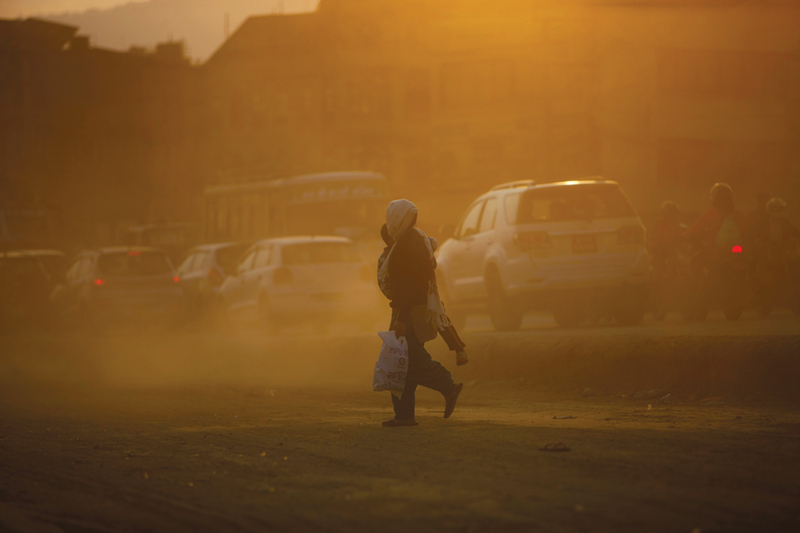 Alarm bells have been ringing about the dust that blankets Kathmandu, but experts say that vehicular exhaust is much more harmful. The earthquake, endless road-widening, and the dumping of construction material on sidewalks have all helped turn the Valley into a dust-bowl. But the increase in the number of vehicles and lack of emission control have led to a worrisome rise in the level of the most harmful pollutants. Although the concentration of dust in the valley’s air is off the charts, dust particles are bigger and not necessarily toxic, meaning they are blocked in the nasal passage. However, diesel soot is microscopic, can be embedded deep in the lungs, and even be absorbed into the bloodstream. The dust from the valley’s road-widening therefore is a symptom, and not the disease. The dust will ultimately settle as the roads are completed. However, wider roads mean more cars and therefore more pollution in future. Kathmandu’s poor air quality has become serious enough for the UN’s World Health Organisation (WHO) to take notice and send Carlos Dora of its Department of Public Health in Geneva to Kathmandu last week. He told Nepali Times: “The government is widening roads and reducing sidewalks. That is going to increase pollution in the long run." The good news is that increasing public awareness is translating into government action. A task force led by the Department of Environment submitted a 12-point recommendation to the National Planning Commission on Wednesday which highlights the importance of improved mass transit. You cannot solve a problem until you understand what the problem is. To effectively reduce Kathmandu’s horrendous air pollution crisis, scientists say, it is important to measure the nature of pollutants. Solutions must be data-driven. Which is why the Kathmandu-based International Centre for Integrated Mountain Development (ICIMOD) in collaboration with Department of Environment set up air quality observatories in Ratna Park, Pulchok, Dhulikhel, Chitwan, Lumbini and Langtang. The idea is to investigate the nature of pollution in Kathmandu and track the transfer of suspended particles from the Indo-Gangetic plains up to the Himalaya. “It is important to understand the emission and the meteorology that affect air pollution, so that we have effective mitigation measures that can solve both technical and behavioural issues,” said Bhupesh Adhikary, ICIMOD’S Air Quality Specialist, while inspecting the equipment at the Dhulikhel observatory. 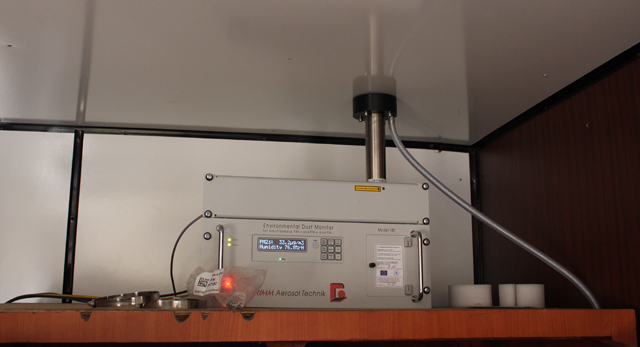 Apart from measuring particulates with diameters of 1, 2.5 and 10 microns, the stations also have analysers to measure carbon monoxide, nitrous oxides and other harmful gases. Scientists can then find out the source of pollutants, meteorological factors transporting pollutants, and propose mitigation methods. Ratna Park was chosen as an observatory site to represent Kathmandu, and the movement of pollutants from the Valley eastwards in the evenings is sampled in Dhulikhel. The Chitwan site measures air quality in the national park, while the Lumbini observatory tracks the trans-boundary movement of pollution. Measurements in Langtang have helped glaciologists understand increased melting of snow and ice due to global warming and soot deposition. “We want to measure ultra-fine particles in the future and develop a model to forecast air quality like we do weather and an Air Quality Index,” said Shankar Prasad Paudel (pic, right) of the Department of Environment. “Ultimately we want to spread awareness about pollution so we can curb them at source." The WHO threshold for Particulate Matter (PM) below 2.5 microns is 10 µg/m3, but Nepal’s national standard is set at 40 ug/m3. Even so, the concentration of PM2.5 in Kathmandu is several times higher than even the minimum national level for most of the day. 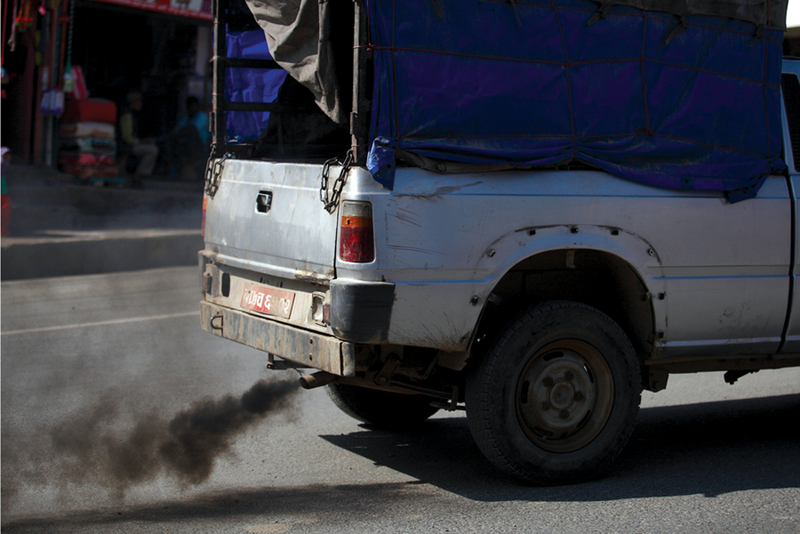 Most of the PM2.5 in Kathmandu comes from diesel exhaust from generators and vehicles. While the use of generators has gone down with 24-hour power, the number of polluting vehicles is rising. Brick kilns in Bhaktapur are another major source of air pollution in that area. Of the 107 kilns in the valley, 105 were damaged in 2015 earthquake, but only 12 of them have been replaced with low-emission kilns. The roads of Kathmandu were always dusty because they were poorly built and used to dump construction material. But after the earthquake and the road-widening campaign, the concentration of dust in the city’s air has become much worse. Recently, pipe-laying work for the Melamchi Drinking Water Project has been a major source of pollution in the valley. The dust levels are so unbearable that last week the Supreme Court directed the government to take immediate steps to reduce it. Although contractors laying water mains have started hosing down some roads, implementation is doubtful. Public health experts and urban planners say the problem with road-widening is not just the dust, but that wider roads will mean more traffic and more pollution. Said the WHO’s Carlos Dora: “I see there are potential solutions to air pollution in Kathmandu. Narrow roads can be used for cycling and pedestrianisation and some roads can be widened for bus lanes to reduce traffic." When inequality is so deep rooted, is another world really possible?